The U.K. Parliament is pouring cold water on Prime Minister Theresa May's draft Brexit deal with the European Union. U.K. Prime Minister Theresa May has finally struck a deal with the European Union on Brexit. Now she just has to get it through a skeptical Parliament. May's relying on her Conservative Party to back the agreement, which sets out rules for how the E.U. and the U.K. will trade, compete and cooperate after the U.K. leaves the bloc next year. But a lot of members of her ruling coalition are rebelling against the deal due in part to how the agreement handles Northern Ireland. After Brexit, Northern Ireland is set to have the U.K.'s only land border with an E.U. state, the Republic of Ireland. So far, neither side has found a way to draw a border between the two without either inflaming tensions between Ireland and Northern Ireland, or alienating Northern Ireland from the rest of the U.K. The current Brexit deal doesn't really have a solution: what it has is a fallback plan known as the backstop. If negotiators can't figure out what to do by 2020, the U.K. will stay part of the E.U. 's customs area until the two sides agree on a permanent solution. That arrangement has sent some Brexit supporters within May's government heading for the door. 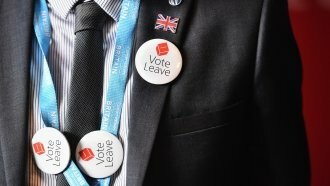 Brexit supporters argue the whole point of leaving the E.U. is to escape structures like the customs union. Member of Parliament Peter Bone told May, "You are not delivering the Brexit people voted for, and today you will lose the support of many MPs and millions of voters across the country." Related Story The UK Is Closer To Making Its Brexit. Here's How It Got There. The backstop also compels Northern Ireland to follow some E.U. regulations that the U.K. doesn't have to. This has infuriated May's allies in Northern Ireland, who are worried the backstop arrangements might end up being permanent. Michael Geary of the Wilson Center told Newsy, "Then you have a situation where Northern Ireland would be in the U.K., but part of the E.U. And this is something that unionists are exceptionally fearful for, because they feel this would be the first step towards a united Ireland. This is a big big fear for them, that Westminster will sell them down the river." May says she's committed to seeing Brexit through, and she's unlikely to be forced out: over half of the Conservative party would have to rebel in order to oust her. But actually getting the plan through Parliament is much trickier: May might have to shop for votes from the largely unsympathetic opposition in the Labor Party in order to make up for the defections within her own coalition. Geary said, "She's just not Blair or Thatcher who had huge majorities, who were forceful figures in their parties. She's been a lame duck since after the election was called last year." There's not much time for last-minute changes to the agreement, either: deal or no deal, the U.K. officially leaves the E.U. on March 29, 2019.